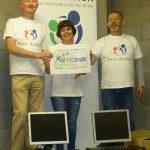 Peer Action is a Brighton & Hove based charity who provide peer support in the form of social activities for anyone effected by HIV, either through their own diagnosis or a diagnosis of friends/family members. 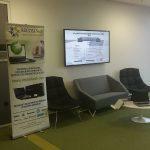 RECOSI was delighted to Pay IT Forward with Peer Action through the donation of IT equipment to enable them to further their goals. For more information on Peer Action check out https://www.facebook.com/peeraction/info?tab=page_info or http://www.peeraction.co.uk/who. 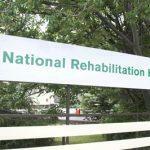 RECOSI carried out a WEEE clearout for St. Francis Hospice this week – one good cause helping out another. Thanks to Peter and all at St. Francis Hospice. 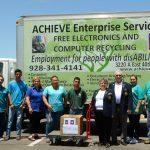 Achieve Enterprise Services, RECOSI’s USA partner, and the Desert Sun Civitan Club partnered together to present a free ‘Pay IT Forward’ desktop computer bundle to AZ Mentor! Just another awesome day at Achieve! 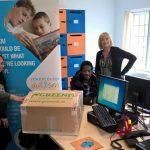 RECOSI, through our Pay IT Forward campaign, was delighted to donate refurbished laptops to Derinagree National School. 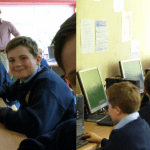 The school, located in a designated rural disadvantaged area in Cork, will benefit form this donation as will the kids who were delighted with the laptops. If you are interested in partnering with RECOSI for the Pay IT Forward campaign please contact anthony.odea@recosi.net. 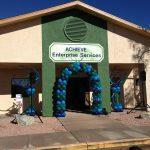 In January 2016 Achieve Human Services, in conjunction with RECOSI, held the grand opening of their new business, Achieve Enterprise Services. This business and it’s state of the art facility in Yuma, Arizona will service the Asset Recovery and Recycling requirements of businesses and institutions throughout Arizona.